Daler-Rowney Cryla Soluble Acrylic Matte Varnish is a medium specifically developed for the protection of acrylic works from environmental pollutants that cause surface degradation. It seals the surface and provides a barrier film. Daler-Rowney Matte Varnish is a watersoluble acrylic medium specifically developed for the protection of acrylic works from environmental pollutants that cause surface degradation. This medium seals the surface and provides a barrier film that can be cleaned or removed and yet leave the paint unblemished. 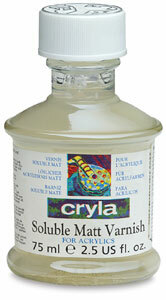 ® Daler-Rowney is a registered trademark.® Cryla is a registered trademark.